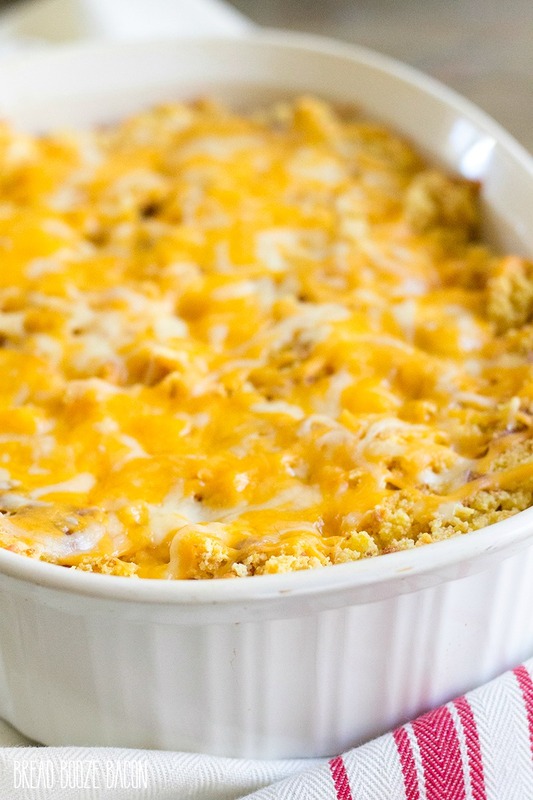 Chicken & Cornbread Casserole is one of those dishes that just screams comfort food! Every time I eat it, I’m transported back to my grandma’s kitchen! I’ve been obsessed with Miss Mary Bobo’s Boarding House for years. Mike’s been to Miss Mary Bobo’s twice on trips to the Jack Daniel’s distillery. Oh, and he’s met Lynne Tolley both times. Yeah. He knows I get jealous, so every time he goes he brings me a new cookbook from their gift shop. This last time, he texted me pictures of the books they have, just to make sure I didn’t have the one he wanted to buy already. I’ve got about 4 of the Miss Marry Bobo’s and Jack Daniel’s cookbooks. This last trip, he got me the Miss Mary Bobo’s Boarding House Cookbook and it’s amazing. It’s all the southern food I grew up loving when my grandma would cook. 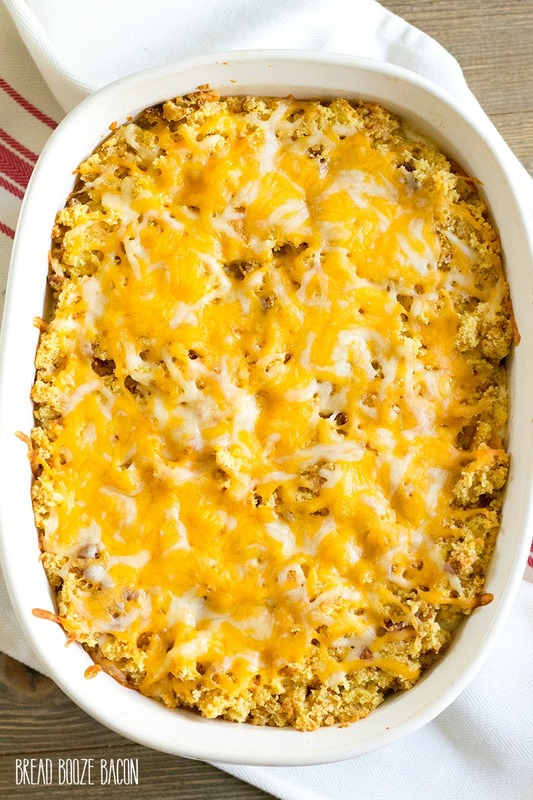 So this casserole is amazing. 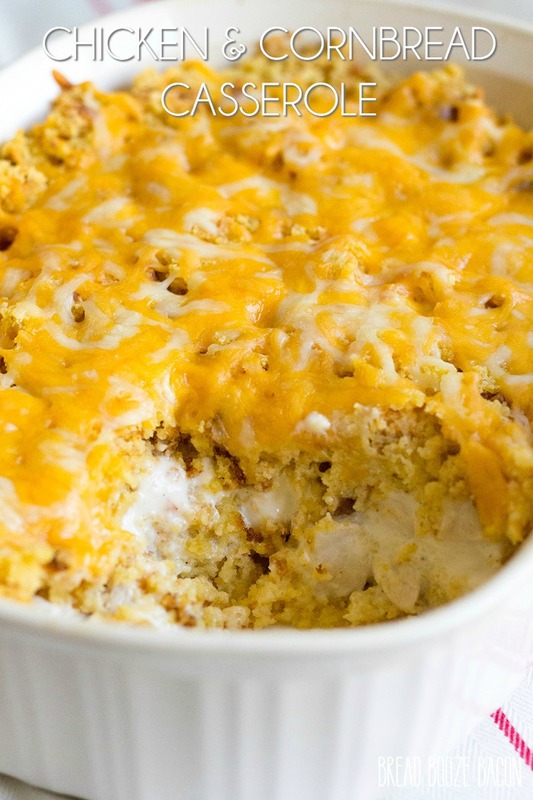 It’s creamy and has cornbread, which is never a bad idea and is just insanely good. Mike’s not into traditional Thanksgiving dressing, and the sage cornbread combo reminded him a little too much of that flavor. 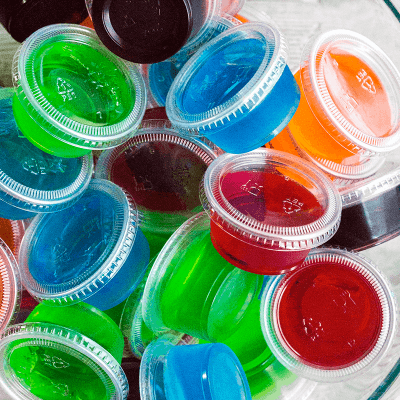 If it’s not your thing, you can leave out the sage and everything will still taste awesome! I’ve made this casserole both ways and love them both. I like to do a little pre-prep when making this dinner. I bake my cornbread oon the morning of or even a day or two before. You’ll need an entire 9-inch by 13-inch pan of it. Then you can leave the cornbread hanging out in the pan on your counter until you’re ready to make dinner. Another way to hurry things along is to grab a rotisserie chicken from the store, ditch the skin, shred the chicken, add that to the sour cream mixture, and layer it all up in a 2 1/2-quart casserole dish. I’m all about saving time on weeknights. 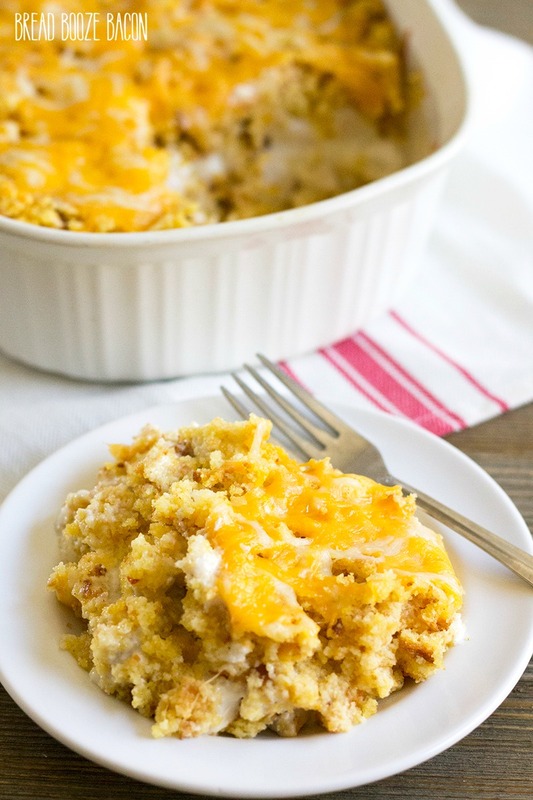 Chicken & Cornbread Casserole is one of those dishes that just screams comfort food! Every time I eat it, I'm transported back to my grandma's kitchen. In a large bowl, combine cornbread, seasoned salt, and sage. Pour in melted butter and chicken stock. Gently stir to moisten cornbread. In a medium bowl, combine sour cream, and mayonnaise. Add chicken, onion powder, and red pepper flakes. Coat the bottom of a 9" x 11" baking dish with half the cornbread mixture. Gently press the crumbs into the dish. Don't pack them in, just a little smoosh. 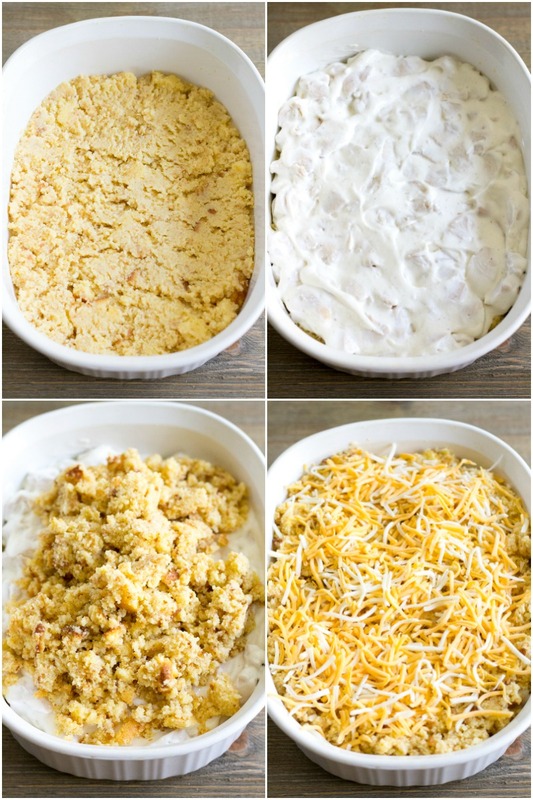 Top crumbs with all of the chicken mixture. Spread chicken evenly over cornbread. Top chicken with remaining cornbread, spread evenly, and don't press the crumbs...just leave them as is. Top casserole with cheese and bake for 30 to 30 minutes. Remove from oven, and serve warm. I used 2 boxes of prepared Jiffy cornbread mix and baked it in a 9-inch x 13-inch dish at 400 degrees F for 15-20 minutes to have enough cornbread for this dish. You also could use a different brand or a homemade cornbread recipe if you prefer. Does the cornbread have to be precooked ? Or an I use polenta and it will cook while in the oven ? The cornbread does have to be pre-cooked. I would not use polenta. It’s not the same as cornbread, and will give you a totally different dish (and potentially a big mushy mess).